Luxury condominium in quiet block, direct oceanfront with beautiful views from your own balcony, living room, and master bedroom. You can access balcony from the master bedroom and living room. Have breakfast on the balcony and watch the sun come up. Fully equipped kitchen, own laundry, breakfast bar as well as dining room. This is one of only 4 condos at White Surf that has steps from its balcony to the pool area and beach without going through lobby. WiFi in condo. Handicap parking spot just outside front door.Tiled and wood floors. 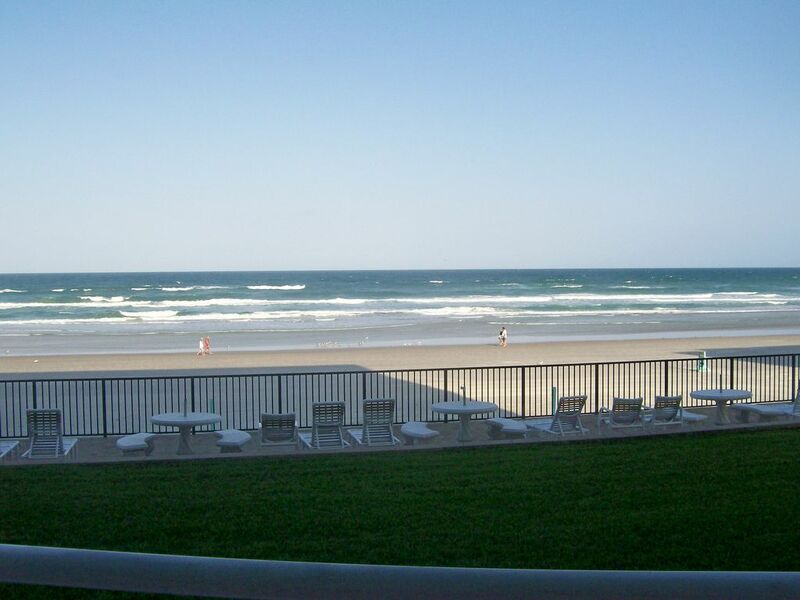 Situated in Daytona Beach Shores near the Sunglow Pier where you can fish, have a drink, or have a meal. Master bedroom has a king, bedroom 2 has a queen and a twin. * $100 security deposit to be paid with final payment, returned promptly after departure. * Please no smoking except on balcony. The location is in a quiet area but very close to all the amenities that Daytona has to offer such as great beaches, shopping, dining. The view from the balcony is awesome! All rentals are Saturday to Saturday. Master has tub/shower combo, bathroom 2 has stand up shower. Walk down steps from my balcony, through a gate and you are on the sand. Guests have use of my underground Garage space or on surface car park. Handicap space right outside the front door of my condo. Free secured wifi in condo. Individual WiFi in the unit. Plug in or use wifi. I will refund 100% if the condo gets re-rented. If you think you may have to cancel then please don't book it. If you do have to cancel then please do it early. DVD player has streaming capability. Many choices or you can use your paid subscription to Netflix etc. Tennis court above car park. Temporarily not in use because of hurricane. Handicap parking just outside front door with no stairs. It is NOT ADA compliant. DVD, 3 TV,s Pool, Washer & Dryer in unit, Tennis court. Overlooking Daytona Beach, the worlds most famous beach, and the Atlantic Ocean. Gorgeous sunrise from your balcony.